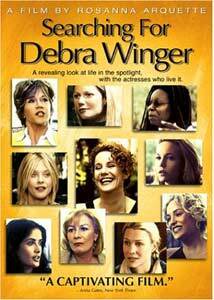 "Why did Debra Winger leave this business?" Rosanna Arquette, who has been facing just these professional dilemmas herself, set out to speak with her colleagues about how women have been faring on screen and off in Hollywood, and this documentary is the result. (I know that some find the word "actress" problematic and pejorative; it's certainly not intended in that manner in this review, and constantly using "female actors" is just too stupid to contemplate here. You know what I mean.) True enough, it's hard to work up much pity for some of these women, who are among the most beautiful, most famous, and most well compensated in the world; when you think about the struggles of working mothers, for instance, it may not be Robin Wright Penn and Meg Ryan who come immediately to mind. But the difficulties of love and work and striking a balance between them are present even if you're tabloid famous, and the fact that here they're being interviewed by one of their own means in most instances that we get to see a candor understandably lacking in talk show appearances to hype their latest projects. There are many unstated and perhaps unintentional ironies to this project, as well�we've all sat around at one time or another and bitched about work with our friends, but only A-list talent can get a high-rent restaurant to close down so that that conversation can be filmed. Many of these discussions were shot at these women's homes, too, and living in these posh spreads in the Hollywood Hills would take some of the sting out of these career issues for me, anyway. Also, it's hard not to think that a wry editor is making a point in the juxtaposition of Tracey Ullman vitriolically denouncing actresses who have gone under the knife, subjecting themselves to silicone breasts and collagen-enhanced lips, and then cutting to shots of Melanie Griffith and Meg Ryan, obvious victims of overzealous and underperforming plastic surgeons. Arquette of course does track down the actress of the film's title, who jettisoned Hollywood after her supernova success in movies like Urban Cowboy, An Officer and a Gentleman, and Terms of Endearment; as audience members, we're much the poorer for Winger's absence, but she seems much more content with her life than do the women still working in the business. There's a suggestion from some of the European actresses�Vanessa Redgrave, Charlotte Rampling�that things are better on the other side of the pond; but that's not an option for most, who seem to recognize that even though it's their faces we're staring at, things in the business won't change until a cadre of female writers, directors, producers, and studio executives grab the reins out of the boys' hands. You go, girls. Image Transfer Review: Scratches abound and the colors can be uneven, but cinematography is not the reason to watch this documentary. Audio Transfer Review: A little overmixed, maybe, but it's all sufficiently audible. Extras Review: The copy on the back of the DVD case promises a commentary track from Arquette, but there's not to be found on the disc; only a trio of trailers, which you can find by clicking on the Lions Gate logo. An empathic look at the limited career options available to some of the most talented people working in movies today, who just happen to be women. When studio executives have the epiphany that women buy 50% of the movie tickets and are as hungry for heterogeneous images of themselves as men are, we can hope for some positive change; Arquette's documentary could also serve as inspiration to young filmmakers, who should think about the best ways to take advantage of these talented, underutilized actresses.